Today is my birthday and it's been a good one so far. I'm not much for big celebrations and my family and friends respect that. I did enjoy a nice lunch at the Lemonleaf Grill (spicy Panang curry), the great cards, thoughtful and fun gifts, calls and emails. And there's still more to come! I had looked forward to today's run which I planned to do at Stillwell Woods this morning. I haven't been on a wooded trail since March's relay race in Bethpage and I thought a change would be nice. When I arrived at Stillwell, I saw that the enormous set of athletic fields were packed with tents and people who were there for some lacrosse-related event. I drove into the lot despite the hundreds of cars, many double parked along the drive. In the past I've been able to find spots way down near the trail entrance, but today there wasn't a space to be found. If I wasn't wearing my H/H Trail Lizards, I would have driven to the nearby high school and run on the track. Instead, I decided to head home and take a birthday rest day. 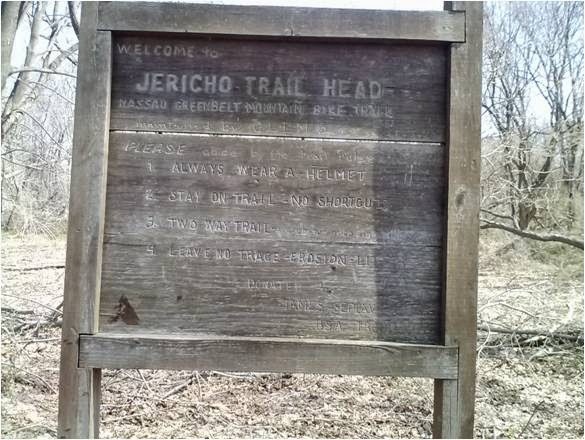 When I reached Jericho Turnpike, it occurred to me that I could run the trails south of Stillwell (i.e., Trailview) that probably had plenty of parking. I was there in two minutes and, while the lot was crowded, there were still plenty of spaces. I wasn't looking to run long today, so Trailview was a good choice. The loop is an out and back measuring about two miles, but with its steep, gnarly, rocky climbs and precipitous drops, you can get quite a workout. As soon as my Garmin captured a signal, I was (literally) off and running, mostly because I wanted to get to the starting point ahead of a large group of hikers. The short run seemed to go by quickly and I was very happy with my response to the hills. I actually liked going up more than going down, because I feared catching a root and tumbling down 20 feet of rocky trail. I maintained a fairly high heart rate which has been my goal for my current training. I always forget how challenging Trailview can be. Later in the day, the family headed over to Syosset-Woodbury Park for some other activities. There are some great hills and I took on the biggest a couple of times. I got outside a couple of times today but didn't overdo it either time. I'm planning to cover 9 or 10 miles tomorrow and need to reserve a little energy for that. Whoo hoo! Double digits, here you come! What a glorious day for running, huh? The future's so bright, I gotta wear shades! Uh...happy birthday. Sorry I didn't know this. I would have sent you a warm Gu in the mail or something. I'm wishing you this weekend's great weather on Monday. Today's was fantastic. Thanks for the birthday wishes. Warm GU is always on the top of my wish list. Happy Birthday, ER!! What a surprise to read that! I hope your day was delightful, and tomorrow's run spectacular! Thanks TPP - enjoy Boston and tell T that I hope she has a great race and a great time.